When I went down to Haiti for the first time in 1986, it was for no good reason. It's true I had a sneaking suspicion that there was a political crisis there, that the dictator-President Baby Doc Duvalier - was being forced out of power. But at the time, I was not a news rat. I'd read Graham Greene's dark novel The Comedians, about a hotelier in Haiti under the rule of Duvalier's brutal father Papa Doc, and it painted a picture of a country both alluring and disturbing  and conveniently nearby! I wanted to see the Tontons Macoute, the Duvaliers' silent secret police, in their blue jeans, floppy hats and sunglasses, wielding their waistband pistols and billy clubs. I wanted to see chubby Baby Doc and his skinny-scary wife Michele Bennett. I spoke French, but otherwise I was very green as a foreign correspondent. I was both innocent and romantic, and that's probably why I had the nerve to go there. So I flew into Francois Duvalier International Airport and got into town just a week before Baby Doc fell. I stayed at the legendary Hotel Oloffson; the international media trickled in and then descended en masse. We were all there at the airport in the middle of the night, fighting off the biting red ants and waiting for the moment when Baby Doc would leave. And here he came, at the wheel of the family BMW, with his wife, kids, mother, some staff and a lot of money in tow. Michele looked out from the passenger window of the silver BMW, puffing on a cigarette, bored by the huge crowd of camera-carrying journalists. They drove the car onto an American C-141 Starlifter cargo plane that took off for Paris, and that was it. Bye-bye, Baby. A new era was supposed to begin. The morning after, Haitians went into the streets by the tens of thousands, uncorked after years of oppression. In front of the blazing white National Palace, they were ecstatic and waved green branches overhead. Hardened foreign correspondents  cowboys who drank barrels of hard liquor and smoked Gauloises  wept uncontrollably in the streets. The Tontons Macoutes fled for their lives, not all successfully. It was an unforgettable moment, and those of us who covered it were hooked. Even today we Haiti watchers are like a band of brothers and sisters. But while it has had its precious rewards, following Haiti over the past quarter-century has also been an exercise in impotence, like watching a car speeding toward detritus on a highway while you're at the window of a skyscraper 20 floors above. The car skids over the obstacle and crashes into the median and begins to burn, and you're up there sipping Perrier in your yoga clothes and thinking you should call 911. The roots of the political unrest and poverty that have distinguished Haiti go deep into the country's past. The nation has an impressive, even shocking history and certainly a singular one. In the 17th and 18th centuries, thousands of slaves were taken from Africa to this New World island, and from their labor France created a fabulously wealthy sugar-plantation economy. Saint-Domingue, as Haiti was called until 1804, was known informally as the Pearl of the Antilles and was the richest of the French colonies. By the late 18th century, there were 500,000 to 700,000 slaves working on plantations, outnumbering the master class at least 10 to 1. When the slave revolt against French rule broke out in 1791, it was not a fair match. No number of Napoleon's soldiers  who fell left and right to yellow fever when they were not killed by rebellious slaves  could put down the revolution. Koupe tet, boule kay! was the slaves' war cry: "Cut off heads and burn down houses!" The uprising was bloody and protracted, and it wasn't until 1804 that the Haitians were able to declare their independence from France. It was the only successful slave revolt in the history of mankind. So it certainly was a remarkable victory: historic, modern in the way the American Revolution was modern. Still, imagine what it meant in regional terms at the time. In 1804 the U.S. was less than 30 years old. A nation that permitted slavery, it now found itself face to face with a free black republic only a nautical dropkick away. The angry war cry of the slave uprising rang in the ears of American slaveholders. Under Thomas Jefferson, the U.S. refused to recognize Haiti and indeed tried to isolate it as much as possible. It simply was not reasonable or wise to normalize relations with a black republic when nearly all your own people of African descent were enslaved. The U.S. did not recognize Haiti until 1862, after the secession of its own slave states. The French naturally were also slow to recognize the new nation, and when they offered to do so, it was at a cost: they demanded from the Haitians 150 million francs in gold (which in 1838 was reduced to 90 million francs). They argued that Haiti owed this sum to France as reparations for property the French lost during the revolt. By property, the French meant not only plantation lands and houses but also plantation slaves. The Haitians were, in other words, to pay France for their own already hard-won freedom. And pay they did, because otherwise they would have remained under the crippling economic embargo that France, the U.S. and Britain had imposed against the new republic. Paying the debt required Haiti to take out high-interest loans. According to one estimate, at the beginning of the 20th century, Haiti was devoting about 80% of its budget to debt repayment. The entire thing was not paid off until ... 1947. Shouldering a grievous debt burden is not good for getting a fledgling economy up and going. Many observers argue that this obligation was the key element leading to Haiti's culture of poverty. Haiti is still paying off disastrous burdens of debt to the International Monetary Fund, which in light of the quake should now be forgiven. Even with history taken into account, there has always been a lot of back and forth among outsiders and among Haitians about why the country remains so troubled and poor. Sometimes people blame the Haitians' traditional African religious practices, also known as voodoo. (Though many Haitians are Catholic or Protestant, many also believe in the old gods. There is a saying about Haiti: 80% Catholic, 20% Protestant, 100% voodoo.) Sometimes they point to centuries of economic dependence, sometimes to the legacy of slavery. There's a bit of truth in each speculation. I remember my first real voodoo ceremony. It was in a little village called Duverger, on a very still, hot night. I was with a friend who knew the place well; he knew Lucy, Yvette, Bernier, Abner, Adeline, Miss and the twins. He knew the whole town. He'd brought fluorescent flashlights to light up the makeshift peristyle. It was very late, but all the children were up, playing, hanging out, waiting for things to start. The ceremony was big-time entertainment in a place without televisions or movies. The voodoo priest was drinking rum and holding on to the pole at the center of the area where the ceremony was to take place. He poured rum on the ground for the gods; it helps lure them down the pole. And down they came: Erzulie, a flirtatious love goddess, and St. Jacques, the warrior, and Baron Samedi, lord of the cemetery, a favorite of Papa Doc's. Baron always talked in a high-pitched, slightly effeminate whisper that sounded like Papa Doc, and I've often wondered which came first, who was imitating whom. It's an amateur actor's dream of a religion. When the gods come down, they manifest themselves by possessing one of the congregants. For each god, there are costumes, colors and a special style of speaking. (This is one reason Greene called his novel The Comedians, for the word's French meaning, "the actors.") The gods empower the people they've possessed. Baron gives orders, Erzulie arranges relationships, St. Jacques bosses and frightens and metes out justice. I don't remember the particular outcome of that service, but bad romances were fixed, someone agreed to give someone else a few more meters of land, a kid came in to have the priest cure his cold. There was dancing and drumming. We drank the sweetest, strongest coffee to keep us awake. Obviously voodoo is more than acting and more than dancing and drinking. These gods are archetypes, and they dwell in the Haitian imagination alongside Jesus and Mary. Very few Haitians don't know this religion, and I have heard the best- educated among them blame magic for some event, usually something personal like an accident  in the same kind of superstitious way I might say it rained because I forgot my umbrella. Magical thinking, as Joan Didion would have it. But when foreign commentators say voodoo sends the message that life is capricious and planning is futile, they are just wrong. Voodoo values life and the interconnectedness of the community. In fact, it's not voodoo but poverty that sends that bad message, the message that life is capricious and planning is futile. Poverty tells you that AIDS and tuberculosis and dozens of other diseases are untreatable, even when the rest of the world has treatments and cures. Poverty also teaches you to cut down trees. Haiti is badly deforested. Now, of course Haitians don't want to cut down their trees. They're not stupid or backward, as some commentators seem to want to argue. Besides giving fruit and shade, the tree is the symbol of Papa Legba, lord of the universe. Nonetheless, trees have been disappearing at a rapid rate. Why? Because Haitians can no longer eke out enough from the land to feed their families, and a cut-down tree that's been transformed into charcoal can be sold to a market lady from Port-au-Prince for cash, and that cash can be used to buy food and other necessities in the (relatively) new cash economy. The roots of the countryside poverty are complicated. One reason farming is poor is that Haitians are still using Colonial-era planting and harvesting methods  hoes, scythes  and the farms are small, scattershot family plots. Another reason is that subsidized produce from the U.S. and other nations has been dumped into the Haitian markets for decades, undercutting the price that Haitian-grown stuff can demand in the marketplace and providing a disincentive to cultivators. As the land gave less and less, more and more villagers left their hometowns for Port-au-Prince to find jobs (or, more commonly, not find them) and seek some means of survival. When i first went to Port-au-Prince in 1986, it was a sleepy little city of about 800,000 people, surrounded by small farms and a few villages. Bougainvillea tumbled down flaking walls that hid tangled gardens. Gingerbread houses lined a few of the nicer streets. 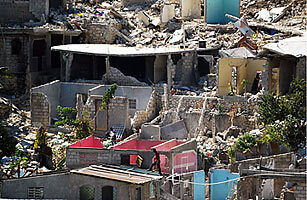 There were two big slums: Cite Soleil, on the way to the airport, and La Saline, nearer downtown. There was a nightclub on the waterfront where Haitian couples danced merengue in fancy clothes until almost dawn. Uptown there were super-luxurious restaurants that invariably served pate de foie gras. But otherwise the whole city seemed to me a chaotic jumble of color and cement, of electrical wires and sidewalk markets and piles and piles of goods made in China. I was new to Port-au-Prince. After I went down to live there and write a book, I began to grow more accustomed to its rhythms and sights. After a while, I stopped noticing the brightly colored minibuses. I was no longer surprised when I saw a truck delivering water to the slums and leaking giant puddles, or pigs rooting about in sewage near the port. I ceased to be so paralyzed by the poverty and began to see instead the indomitable industry of the Haitians. I had never anywhere seen people who were busier. Of course, they had to be busy: just to get water, you often had to have a plan that required at least half a day and a walk of a mile or more. As one friend said, laughing, "Yeah, sure we're busy. But we never get anything done!" Haitians are always laughing. You have to develop a major ironic sense of humor when you live in such hard conditions. In particular, Haitians enjoy a good laugh at the expense of foreigners who say nice things about Haiti. I remember once telling a Haitian friend that I loved his country. "If you love it so much," he said, "what about this plan? You give me your passport, and you stay here while I go to your place." But when I visited last year, I realized the Port-au-Prince of my first days there was no longer a medium-size town. This city of almost 2 million now stretched out over the nearby farmland and farther. The green outlying area of La Plaine, where the future President Jean-Bertrand Aristide started building himself a huge house in the late 1980s, was now just another Port-au-Prince neighborhood, as was Freres, another village, which used to seem to me about a day's drive away through the country. And up and down the steep ravines that line the roads from Port-au-Prince to the wealthy suburb of Petionville up the hill were new shantytowns seemingly made of plaster and glue and paper clips and washboards and oil drums and pieces of cardboard and tin, where the new people from the countryside were living. You couldn't see any life there from a distance, because the houses were built so close to one another, both horizontally and vertically, that the roofs blocked the sight lines. All that is gone now, in rubble at the bottom of the ravines. When a city is leveled, as with New Orleans or Hiroshima, you have so many memories of it and so many connections, now severed, that it's as if you'd lived a fiction, a novel, instead of your real life. (Haiti has something of a fictional quality on the best of days anyway.) For me, it now seems as if every moment I spent there  having ginger tea with a friend, chatting with a blue-eyed priest as gunfire rang out in the city below, going to an exuberant funeral, watching Aristide rearrange his eyeglasses and give a speech, sitting at a car wash as orphan boys used rags to somehow get my car dirtier  was nothing more than a prelude to the quake. Many of my friends have survived, but some have not been heard from. I'm ready to mourn them and the 100,000 or more who died. But I've shed only a few tears so far, I think because I'm still in shock. I'm not in Haiti yet, so I don't viscerally believe it. A friend of mine has written that even now, after pulling friends, dead, out of the rubble with his hands, he can't believe or understand all he has lost. And, of course, even what is lost is not entirely lost. You lose the palace, but not the memory of the palace; you lose the child, the mother, the grandparents, the husband, but not the memory of those people. Over time, memories come to replace the people and places, inadequately, but nonetheless. Parents pass down the memory to children, or aunts to nephews, or friends to friends' children, and on through generations. Books guard and concentrate those memories, and art does too, and photographs, scattered throughout the world. In Managua, another city that suffered a terrible earthquake, people still give memory directions: take me past the square where the old oak tree used to be, then go left at the corner where that church was. Reality is fleeting, and what seems substantial is not really so. We know this in some way every day as we walk around doing laundry and driving to work and picking up kids. We know that life is precious, and every minute valuable. But nothing can ever bring this understanding of life's ephemeral quality home so quickly, so solidly and so absolutely as this utter destruction, wrought in less than a minute's time.